An online campaign seeks to remove the deputy leader of the Labour Party from his role after he argued Labour should more forcibly handle incidents of anti-Semitism within the party. 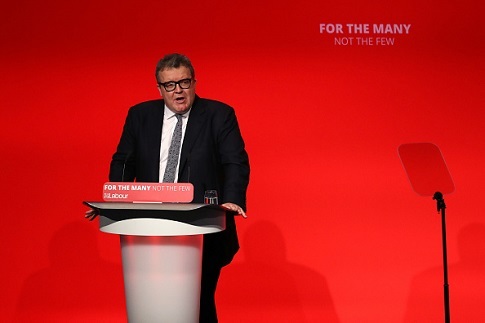 Tom Watson, a Member of Parliament for West Bromwich East, said Labour risks a "vortex of eternal shame" if it does not deal with the issue of internal anti-Semitism directly. The Twitter hashtag #ResignWatson trended in response to Watson's comments, according to The Guardian. Watson was taken aback by the response, tweeting, "I never, ever thought I’d be facing demands to #resignwatson for standing up for people who are facing prejudice and hate." Nevertheless, he vowed to keep fighting. In a weekend interview, Watson said Labour has "to take a long, hard look at ourselves, stand up for what is right and present the party as fit to lead the nation – or disappear into a vortex of eternal shame and embarrassment." Watson also encouraged Labour to adopt the International Holocaust Remembrance Alliance's definition of anti-Semitism in full. "I have made no secret of the fact that … we should adopt the full IHRA definition and should do it without delay." Labour is poised, according to The Guardian, to adopt three of the four examples of anti-Semitism included in the IHRA definition that it had previously left out of the party's code of conduct. The party remains at an impasse over a final example, "claiming that the existence of the state of Israel is a racist endeavour," out of fear that this could limit almost any criticism of Israel. On Monday, the chair of the Jewish Labour Movement, Luciana Berger, filed a complaint against George McManus, a member of Labour's national policy forum, for anti-Semitic comments apparently directed at Watson. "Apparently Watson received £50,000+ from Jewish donors. At least Judas only got 30 pieces of silver," McManus wrote in a since-deleted Facebook post. Watson received money from businessman Sir Trevor Chinn. McManus has since apologized, saying, "I fully accept that such an analogy is wrong and am sorry for making the comparison." Labour leader Jeremy Corbyn released a video over the weekend apologizing for anti-Semitism within the party. "Our party must never be a home for such people and never will be. People who use antisemitic poison need to understand: you do not do it in my name or the name of my party. You are not our supporters." "And anyone who denies that this has surfaced within our party is clearly actually wrong and contributing to the problem," Corbyn continued. Last week, Corbyn apologized for the "concerns and anxiety caused" after he participated in a 2010 event that compared Israel’s actions in Gaza to the atrocities committed by the Nazis. Two weeks ago, the United Kingdom’s three main Jewish newspapers released the same front page and argued Corbyn represented an "existential threat" to Jewish life in Britain. This entry was posted in Politics and tagged Anti-Semitism, Jewish Community, United Kingdom. Bookmark the permalink.